I live in Ellicott City, MD. 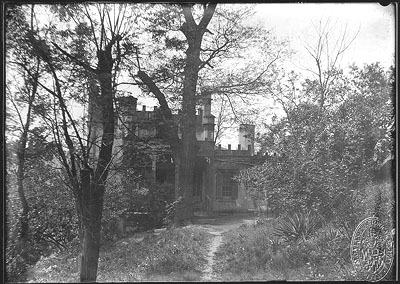 I came across your website about castles in the US. I understand you have the Libson Castle and the Enchanted Forest Castle on Rt. 40. Well, I'm writing to you to let you know that you forgot one more castle. 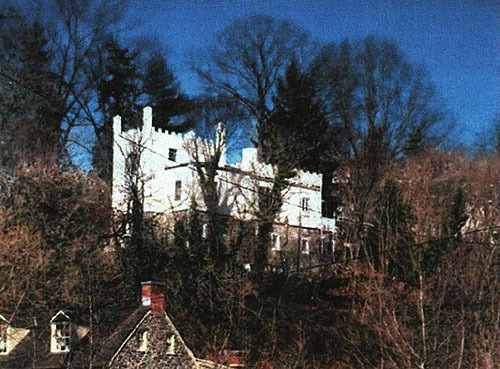 It's in the historical section of Ellicott City above the B&O Rail Road Station called Angelo's Castle. I wanted to give you what little information that I have on Angelo's Castle. 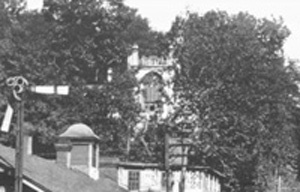 It was built by Samuel Vaughn back around 1831, and it was orignally referred to as Angelo's Cottage. I have attached a pic that I found on the internet. The address is 3749 Church Rd, Ellicott City, MD. I am going to try and go out there tomorrow and see if Ican find it and see if it is abandoned or has current owners. Wish me luck. I will try and take pictures if i'm not too creeped out. It looks scary! 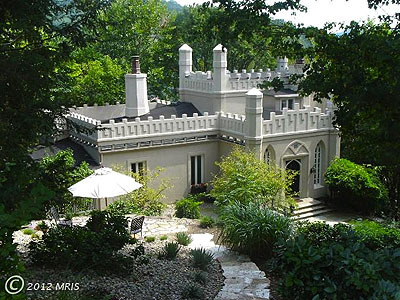 I was 14 when my family purchased this castle from a lady who had been born in the castle. My bedroom was upstairs with the top half of the cathedral window in the photo! (yes, it made me feel a princess!) The Castle was in need of major work. It was original with a few updates such as plumbing and electrical. The two bedrooms upstairs were added long ago. The wide plank, hand hewn peg floors were gorgeous. Heated by oil in the center hall, and several fireplaces. The basement "dungeons" were a little spooky. But on the back side they opened to the sheer drop off where the house sits. Many passages, nooks and crannies! National Geographic had contacted my mom about the possibility of it being part of the "underground railroad". The path from the road to the house was outlined on both sides by thousands of daffodils in the spring. I loved the peacefulness, the serenity, the trees and the smell in spring, but nothing was more beautiful than the snow laden castle, trees and grounds in winter! My dad died suddenly just a few years later, a young man of 40. Mom found it a daunting task to remodel, and maintain his business in the city. ( He was a funeral director/ mortician!!! Needless to say, Halloween was a lot of fun there!) After awhile, she tearfully sold this precious gem! It fell into several hands, and is currently totally remodeled into a french chateau style. I will gather some photos to send to your site if you would like. I sure miss this place! I spoke to Barbie Hazel Gillespie tonight. Barbie's grandmother bought Angelo in the early 1900's at auction and it was in the Watkins/Hazel family until around 1970. There were no witches at Angelo, but there was a legend about a ghost....Angelo was built by an artist and the legend said that as long as an artist lived in the cottage, the ghost would not be seen. Since Mrs Hazel was an artist... the ghost was not seen! To Jan, Judy , Eddie and any other 61-62 HHS folks......Barbie says "Hi"!